Coldfusion 9.0 relies upon a Java virtual machine to provide a host for its process. If it will not start the Java virtual machine may be missing things it depends on. 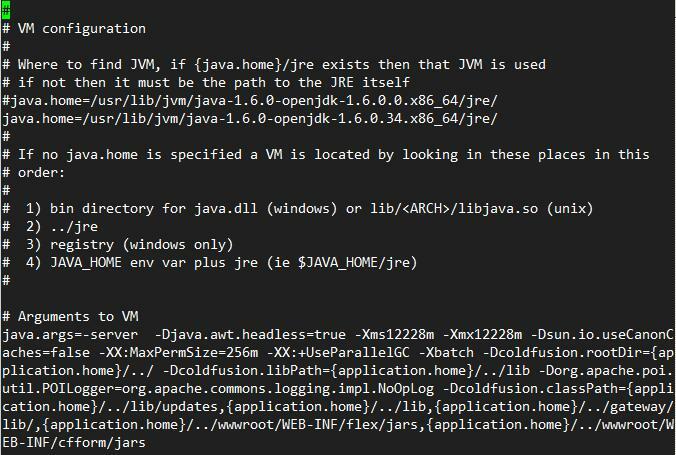 In this case if the operating system Java package is updated and the Coldfusion jvm.cfg (referred to as jvm.config) refers to a static path for an old java package it can obscurely suggest the jvm.cfg might be corrupt. Although this is not the case, the Java package may be missing. and is updated by the alternatives method when updating the actual java runtime installed for the operating system. Explicitly pathing is "brittle" and will break without warning when a regular # yum update command is run to update all the packages in a RHEL or like operating system. Also be [aware] that RHEL5 and RHEL6 have different versionlock plugin pacakge names. Or be sure to keep the /opt/coldfusion9/runtime/bin/jvm.config file up to date when updating the operating system java version. Or do not define it here (jvm.config) and allow the settings in the /etc/init.d/coldfusion9 startup script to take priority. Unfortunately Adobe documentation demonstrating explictly choosing a Java version to host the Coldfusion process "other than" the Java jre that comes with the product is brief and general, to the point of not describing pitfalls relating to regular patching and updating for bug fixes and security matters.